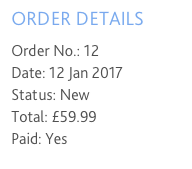 I've updated my Order ID Start Number to 12421 but it is having no effect in either the backend or the frontend. Orders are still incrementing from the previous value. I've tried removing all of the previous order, cleared the cache, and it still does not work as expected. I didn't remove all of the orders, i still had shipping and incomplete items in there. This now works as expected.